Men and women suffer from very different types of hair problems. They very from thin, limp, brittle hair to diffuse, local or complete baldness. In general, hair loss is very normal. In fact, we each lose approx. 70 to 100 hairs every day. However, once we begin losing more hair, it is indicative of a problem and it can result in baldness. The cause of hair problems can often be found in hormonal changes, genetic predisposition, nutrition, medication, illness or stress. A beautiful, full head of hair is a beauty ideal. It increases people's self-confidence and wellbeing. As such, the impact of hair loss is visibly, and invisibly, significant. It changes one's appearance and can even lead to worry, sadness and depression. Resolving hair problems without making use of medical procedures is a challenge and Pro Haarzorg gladly took up the gauntlet. After years of tests with experts and test subjects, a unique treatment was developed that delivered the best results. It consists of a combination of equipment and innovative products, and makes an average hair increase and improvement of no less than 85% realistic! To measure is to know! The right diagnosis is key to the success of the treatment. The Multi-functional Hair Growth System contains software that makes it possible to extensively study the hair and skin. A camera takes digitally enlarged photos which are stored and immediately analysed. The practitioner and client can now see precisely what's going on, and with this information, the treatment plan can be formulated. New photos will be taken throughout the treatment process, ensuring that the results can be fully shown and followed. If you're looking for the solution to many hair problems, without the use of surgical procedures or hair transplants, Pro Haarzorg has it. One device and one treatment with which you can guarantee your clients demonstrable results. A scientifically proven and safe method based on the natural hair growth process. Low Level Light Therapy has been used to combat hair loss for some time now. Dozens of years ago, the effect light has on the skin and hair was discovered and scientifically published by NASA. They had found that red light is beneficial to cell metabolism, blue light improves blood circulation and yellow light regulates the production of sebum. Low-energy laser light extends the active growth phase of hair and shortens the anagen phase. More hair appears, and the condition of the hair already present and the scalp improves. Hair grows longer, breaks less readily, falls out less and its colour even improves. These discoveries have been incorporated into the Multi-functional Hair Growth System (MHS) from Pro Haarzorg. However, the thing that distinguishes Pro Haarzorg from traditional systems is that the Multi-functional Hair Growth System possesses several functions. Electronic hair inspection to arrive at the correct diagnosis and to track the results of the treatment. Oxygen therapy to deeply deliver the hair growth serum. Radio frequency (R.F.) therapy to activate the hair follicle cells' absorption of the ingredients. Light therapy (cold laser and Photo Dynamic Therapy, (PDT)) to stimulate the activity of the hair follicles, activate dormant hair follicles, and to improve the quality of the scalp, the present hair and the new hair. Electronic hair inspection to formulate a diagnosis and compose a treatment plan. Oxygen therapy to deliver Dermaheal™, a hair-growth stimulating serum. R.F. massage to stimulate the absorption of the ingredients by the cells. Light therapy: low-energy laser light, infra-red light and LED light unleash biological and chemical responses in the skin and hair follicles. The active growth phase of the hair is extended and the anagen growth phase is shortened. The use of home products and, if necessary, nutritional supplements and medications. Evaluation, electronic monitoring and maintenance of the results. When your clients are introduced to Dermaheal™, success is guaranteed. Our hair needs vitamins and minerals in order to grow, which is why the use of the Dermaheal™ hair-growth stimulating products, both during the treatment process and at home, is a part of the treatment. 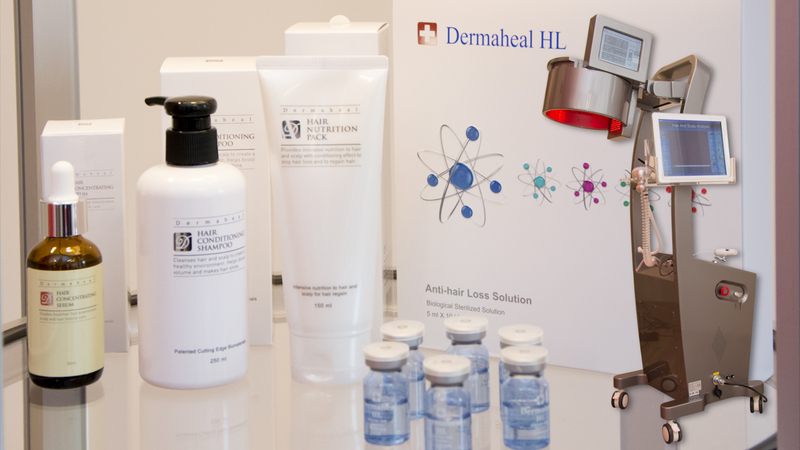 Daily use of Dermaheal™ halts hair loss and ensures the production of more strong, healthy hair. The effectiveness of Dermaheal™ has been scientifically proven and the products are produced using 56 active and natural ingredients, including biometric peptides, growth factors, multivitamins and enzymes. Each of the ingredients has been certified by the INCI and none of them have been tested on animals. They are produced by the world-renowned biotech lab Caregen in South Korea, which is ISO 9001 and 2000 certified. These certificates guarantee the highest quality. The hair growth serum from Dermaheal™ not only contains the necessary nutrition; it also delivers growth factors, which encourage the hair matrix to produce hair. Dermaheal™ was responsible for a 20% increase in the test subjects' treatment results. When treating severe baldness, we may add our nutritional supplement to the treatment. Discover Pro Haarzorg's new hair loss treatment.